With the trade deadline fast approaching, it’s easy to spot the teams for whom multiple deals would make most sense. Which is all well and good, until the time comes to actually pull the trigger. The past decade has taught us that certain general managers will be hyper-aggressive come deadline time, whether their teams are in the race or building for the future. Others will sit tight, even when circumstances scream for a deal or three. With the help of indispensable ESPN Stats & Info, we’ve compiled a list of the most and least aggressive deadline-dealing GMs of the past 10 years. By looking into their past, we can gain a better feel for what they might do (or not do) in the very near future. And here are the numbers in the month before the deadline. The most flawed of all the first-place teams (assuming the Dodgers can actually count on Matt Kemp and Andre Ethier playing and playing well sometime soon), the Pirates seem likely to make a splash. Turns out they’ve got the perfect GM to do it, if history is any indication. No general manager in the past decade has pulled off more deadline deals than Huntington, whether in July only, or in June-July. Last season offered a textbook example of Huntington’s M.O. The Bucs made four trades between June 12 and July 5, 2011. All four of those trades involved players to be named later, and constituted the kind of frequent, minor deals you’d expect from a low-revenue team searching under every rock for help. One of those deals has already paid noticeable dividends: Red Sox castoff Michael McKenry has emerged as the Pirates’ starting catcher with Rod Barajas battling injuries and Rod Barajas-ness; McKenry’s slugging .480 in 116 plate appearances this year. Huntington’s two deals right before the deadline spoke to clearer signs of a go-for-it attitude. The Pirates acquired veterans bats Derrek Lee and Ryan Ludwick on July 30 and 31, respectively. At the time of the Lee trade, the Pirates trailed the first-place Brewers by a reachable 3 1/2 games. Barring a cataclysmic fall, Pittsburgh figures to be in better shape this year than last. The question is, how hard do the Pirates push? Do they pursue players like the upside of league-average production, as they did with Lee and Ludwick (and could with Alfonso Soriano and his ilk in 2012)? Or do they dip into their pitching-rich farm system and target a top-flight pitcher like Zack Greinke or Cole Hamels, or even a talented (if slumping) outfielder like Shane Victorino? Young arms like Gerrit Cole and Jameson Taillon arguably rank among the top 10 prospects in baseball — not the kind of assets you’d expect a low-revenue team to give up for a player likely to leave via free agency three months from now. Then again, a deep playoff run could be just the catalyst a team with a 20-year streak of sub-.500 seasons would need to grab fan interest and juice revenues. And the new collective bargaining agreement change preventing teams from collective compensatory draft picks on players acquired via in-season, walk-year trades could drive down the price of elite talents just enough to make them attainable without sacrificing all-world prospects to do it. There’s a very real chance the Pirates get someone significantly more interesting than Derrek Lee this time around. 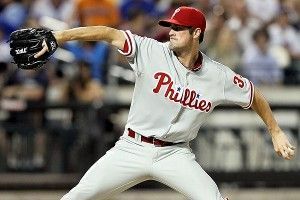 No team holds a bigger trade chip than the Phillies do with Hamels. But something’s made me skeptical that Ruben Amaro Jr. would go through with a huge sell-now trade at the deadline. Maybe it’s that new CBA rule change, which makes Hamels worth no more than a brief rental for any team that can’t subsequently extend his contract, what with compensation picks no longer factoring into any potential deal. Maybe it’s Amaro denouncing rumors of a Hamels deal and saying the Phils want to sign their star left-hander (granted, many GMs say such things right before doing the deal). Or maybe it’s the potential cognitive dissonance that could ensue, with Amaro talking himself into believing that the Phillies could make a big second-half push with Chase Utley back and Ryan Howard about to return — especially with a second wild card in play. and also shuttled Lee to Seattle, supposedly to restock the farm system given all the prospects lost in the Doc trade and elsewhere. Of course, Amaro’s other monster deal did come at the deadline: Four and a half months before Amaro flipped Lee to the M’s, he swung a July 2009 trade with Cleveland that ended up being a steal for Philly, given how few top-flight keepers the team gave up (none). If Amaro does decide to aggressively shop his key veterans, Hamels, Victorino, and several more minor contributors could be prime trade candidates, with Jim Thome and Chad Qualls both recently shipped out of town. But you might not want to bet on such deals going down, logical though they might be. Good luck getting a read on the Blue Jays. The Jays are the second-highest-scoring team in baseball. That’s good. They’re also in last place in the AL East. That’s bad. But they’re only 2 1/2 games out of the second wild-card spot. That’s good. But their starting rotation is so decimated by injuries that it now consists of Ricky Romero having a lousy year, and a 55-year-old Luis Leal. That’s bad. Jose Bautista, Edwin Encarnacion, and Colby Rasmus and the rest of the Jays lineup have been so potent offensively that Toronto could try to make a smaller deal or two for some stop-gap starting pitching, then hope to get injured starters like Brandon Morrow back in time for a playoff push. They could even go bigger, with reports that a Toronto scout watched Matt Garza pitch (really poorly) Thursday against the Braves. On the other hand, Encarnacion’s monster breakout (.295/.379/.564 with 22 homers in 80 games, already the second-highest total of his career) and free-agent-to-be status could make him a contract-extension gamble the Jays don’t want to make, and a player for whom a dozen or more GMs would fling themselves into molten lava to acquire. Kelly Johnson, a half-dozen relief pitchers, and others could also bring back valuable young talent. With so many variables in play, and just three-plus weeks left to sort everything out, a tamer general manager might get consumed by inertia and end up doing little to nothing. But that’s not Alex Anthopoulos’s style. While not all of his deals have worked out, Anthopoulos has shown he’s not shy about making ’em; among current GMs, only Huntington has pulled off more June-July deals on a per-year basis than Toronto’s man in charge. Whether it’s last July’s deft nab of Rasmus, 2010’s five-player Yunel Escobar deal and subsequent Brett Wallace-for-Anthony Gose swap, or major offseason moves like the Roy Halladay trade and dumping Vernon Wells’s horrific contract on the Angels (and then regretting the rest of that trade, which swapped Mike Napoli for Frank Francisco), Anthopoulos has shown no hesitation in radically altering his roster. The direction the Jays take could change the entire complexion of the trade market. When you’re holding the best potential bat out there, you get to call the shots. Teams will be closely monitoring the Rays, too. After a hot start to the season, Tampa Bay has suffered injuries to key players like Evan Longoria and Matt Joyce, dropping them to just three games over .500. Having two wild cards means they’re still very much in the race. But the potential swing here, with B.J. Upton, James Shields, and Carlos Pena as potential trade bait if they become sellers, and multiple lineup needs to address if they’re buyers, could be substantial. Rays GM Andrew Friedman has been one of the least active deadline dealers in the game in the past six years, though, which could portend the Rays mostly standing pat and waiting for better health to arrive.